Over the last half a century food production has become an industrial mammoth with its core objective to make as much money as quickly and as cost effectively as possible to expand-expand-expand - kind of like the waistlines of the ignorant we. With interest groups and lobbyists buying favour with politicians to push through legislation benefiting their handlers, this is not limited to oil companies, gun manufacturers or the cigarette industry, but also in the world of food production. All to the detriment of the world's population. When the low fat craze struck, food manufacturers had to replace the taste, resulting in adding more sugars by manufacturers to increase the diminished taste. These hidden sugars has ended up with people gaining weight where they thought they being healthy using "low-fat" product. And, under a sca, sugar has the same effect on the brain as cocaine! From the Oscar-winning producer of An Inconvenient Truth, Laurie David, this enlightening documentary looks at the misconception we've been fed about diet and exercise. While this is from an American perspective, that huge country tends to dictate Western trends. With obesity still on the increase, the food manufacturers have not been playing open cards with the public, and with lobbyists dictating legislation for their financial interests, the blindfold is quietly slipped on while dietary unsound companies barrage viewers with tasty looking (but calorie loaded) products, and infiltrating schools with sugar laden and deep fried junk. In many ways it is false energy fueled by false food. I'm no health nut and like some really bad food, but I'm lucky to have a metabolism that doesn't pack on the pounds. The issue has surpassed "self-control", as children are brought up on these bad dietary choices, much of it sold as being healthy or natural (until you inspect the ingredients and nutritional info - something many companies have been fighting to make public, often finding crafty, misleading pseudonyms). Viewers have come to expect documentaries to reflect a more entertaining flair, not wanting to be preached to. Fed Up balances facts with an engaging style as its revelations unfold, some of it quite mind blowing. Narrated and co-produced by respected TV journalist Katie Coeric, the filmmakers reveal these staggering facts clearly and concisely, illustrating the science behind nutrition, and the real effects of calories vs exercise. Most people are quite aware of the fact that most of what they put in their mouths are probably bad for them, in the long the run - but the immediate gratification is so good(!) While many will avoid this movie due to knowing this fact, those are actually the ones who really need to watch this, and stop slowly killing themselves. 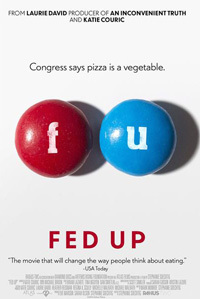 Makes a great companion piece to movies like Super Size Me, Food, Inc. and That Sugar Film.